There are some who think that the Catskills represent only a bygone era, and that perhaps something like the Catskills Irish Arts Week (CIAW) that takes place there every summer is only fighting a losing battle in preserving an important Irish heritage up there. But they would be underestimating the resilience and the creativity of the “Living Tradition” of Irish music and culture that is the lifeblood to those who follow it around the world, and why certain places provide sustenance to it. That was very apparent to me with the preponderance of new recordings debuting this year in East Durham. Four of them stood out for important roles that the CIAW may have played in sparking their production. The music of Sliabh Luachra (the Rushy Mountain) has been an important part of the tradition keeping alive that regional style so popular in Kerry, West Cork and West Limerick through the tunes and the exuberant country set dances. Chief among its exponents are fiddling master Matt Cranitch from Cork City and the box player extraordinaire Jackie Daly from Kanturk, both fierce proud Corkonkians. For seven years they have flown the Banner of Sliabh Luachra music high over the Catskills with their annual appearances as teachers and performers, and so it behooved them to document that musical liaison with a CD which they have at long last after so much teamwork in the Catskills. In that span thousands have listened to them play (accompanied by Paul deGrae) and hundreds learned some tunes from them and absorbed the style and essence of that special musical genre. Thanks to the Arts Council of Ireland and a special grant, the recording allows a much larger audience to visit the proverbial banks of The Living Stream as the CD is called, providing a musical tour d’horizon of the broad spectrum of music that sustains the region. 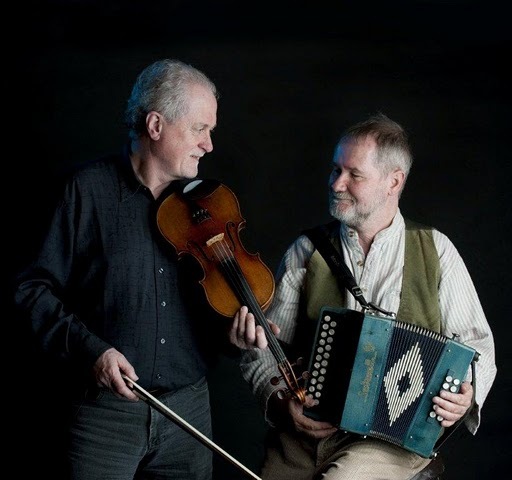 Thirty-one tunes grace the 14 tracks and it goes way beyond the slides and polkas we love, as we are treated to a great musical conversation between two masters of the tradition in their element as well as solo tracks to further define the bona fides of these venerable Irish musicians. Reared in North Connemara, the fiddling Kane Sisters of Letterfrack have made their presence known among the cognoscenti for years, going back to their breakout work with Sharon Shannon and the Woodchoppers. Producing their third album, Side by Side, this summer shows sisters Liz and Yvonne still producing that wonderful music in unison but also stretching themselves to write, learn and interpret new tunes that are so necessary to stay on top as full time teachers and touring performers on both sides of the Atlantic. Three compositions from Liz, including the appropriately named title track, are among the 30 tunes on 12 tracks that are gorgeously played full of the sisterly simpatico that characterizes their playing note for note. Over five years in the Catskill Mountains and its subsequent U.S. tours, they have created a following that recognizes the quality of their music and the care and feeding that they pass on so readily to those who come in contact with them. If you caught the brief two week tour of the Kane Sisters with Edel Fox in late July, you might be forgiven if you thought another “sista” was part of their act and charm. They have become so close over five years of teaching and performing together in the Catskills and Elkins that is shows a strong musical affinity and appreciation. But the young accomplished concertina player from Miltown Malbay who won the TG4 Young Musician of the Year in 2004 has always carefully and wisely chosen her musical influences, and now at age 24 she has become one of the more accomplished Irish traditional musicians on the island as well as one of its more skillful teachers. Drinking deeply from the well of traditional music is no academic exercise for Edel Fox, though she has two degrees from the University of Limerick. Her playing is all about enjoying the music and the joy of creating it with friends old and new and everyone in between. Her new recording Chords and Beryls delivers lively tunes, with great lift and panache that suggests a wiser head that has soaked up all the tradition has to offer in and outside the classroom. Twenty-nine tunes make up the 13 track opus that gives ample evidence of her musical education and why she will be in the vanguard of Irish musicians for years to come. The surprise entry in the Catskills this summer was the emergence of Nicgaviskey, the album and the people (Bernadette and Caitlin Nic Gabhann, Sean McComiskey and Sean Gavin) who marked the one year anniversary of a session in Furlong’s Riverside Pub in 2009 that in one fell swoop captured what lures people to traditional music. From tradition bearing families in Ashbourne, Co. Meath, Baltimore and Detroit, this alliance of young talented musicians steeped in the chunes of old and today. That a chance meeting in a Catskills pub could lead to such lovely music is no longer a surprise, but it is just the kind of punctuation that speaks volumes about why such gatherings of people are important to traditional music. Thirty-one tunes adorn the 15 tracks on Nicgaviskey, displaying a well-rounded repertoire that the nascent quartet shares inside the tradition and individually. It will be interesting to see where it takes them from here, and a launch this week at Fleadh Cheoil na hEireann in Cavan may well turn into a launching pad for further craic. Four albums for the ages that will provide hours of great listening without having to matriculate in a summer school, and thanks to insightful liner notes your sum of knowledge will be enhanced as well. To find out more visit the following websites: www.thekanesisters.com, www.edelfox.com, www.nicgaviskey.com and to order link to www.ossianUSA.com (phone 603-783-4383) or www.custysmusic.com.